This is an issue of Collier's weekly magazine, published September 8, 1945. Good condition, no cover, missing pages 3/4, 5/6, 9/10, 25/26, 31/32, 53/54, 69/70, 71/72. Features a GE ad starring actress Mary Martin. TEN YEARS OF RECORDINGS, Year by year, By George Jellinek. Folklore, Fakelore, and Poplore, by Marshall Fishwick. August 26, 1967; Vol L, No 34. PROJECT OF THE DECADE, SINGER OF THE CENTURY, By John Gulshaw. COVER: EARL SCHENCK MIERS, Author of "The General who Marched to Hell (see page 8) Cover Drawing by Frances O'Brien. The Author: EARL SCHENCK MIERS, by K. S. TWENTY-FIVE YEARS AFTER By Malcolm Cowley. 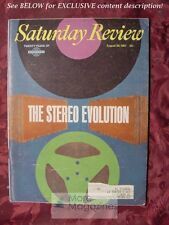 Okay, This next item up for sale is the 1964 Evergreen Review August September. Kitten's Back. Jack Keroauc. The model is a size 8 and 5’ 10”. Math Even Can Understand. PETER F. DRUCKER. Standing Room Only. ARTHUR C. CLARKE. Drawing By Tomi Ungerer. ISSUE DATE: APRIL 1958; VOL. 216, NO. 1295. AFTER HOURS. Mr. Harper and Waverley Root. NY: Grove Press, Inc. 1, No. 1, 1957. 5 1/4" x 8", 192 page magazine bound in pictorial wrappers Good condition. Small creases to the corners. Heavy rubbing and wear along the front spine edge. The front wrapper is still attached. Child Issue. Frederick Franck; Richard Lewis; Lobsang Lhalungpa; John Loudon; Lynda Sexson; Don Talayesva; P.O. Travers; and Art and Stories by Children. This is a fictional magazine written and distributed by DC Comics in 1993. Magazine is in excellent condition. 1977 SPRING EDITION 126 PAGES P.L TRAVERS, SAM GILL AND OTHERS. This is a cover only from an issue of Collier's weekly magazine, published October 20, 1951. Cover features Josef Stalin. Very good condition, cover only, no magazine. The item must be in its original condition. What Leonard Bernstein Is Doing to the Philharmonic. . Harold C. Schonberg. Cover Design By Bob Cato; Photograph By Barrett Gallagher. 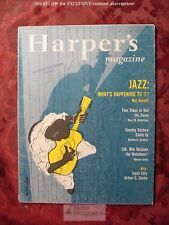 HARPER'S Magazine. May 1959; VOL. 218, NO. 1308. 18 19 20 21 22 23 24 25 26 27 28 29 30 31. This is an issue of Collier's weekly magazine, published December 3, 1949. Good condition, no cover, missing pages 35/36. The item must be in its original condition. READER'S DIGEST magazine - April 1940. It is complete. I couldn't find much information on the history of the magazine myself online however have issues dated in the 40's and 50's era. Migration, Politics, and Welfare, by Richard A. Cloward and Frances Fox Piven. The welfare rolls are climbing not because people are lazy, but because they are moving to areas where eligibility rules are more liberal and the politicians more responsive. Essays for the Modern World," by Horace M. Kallen, edited by Alfred J. Marrow. COVER STORY: Countdown for Kennedy by Irving Kolodin; Cover photo: Facade of Edward Durell Stone's Kennedy Center for the Performing Arts, Vince Finnegan. Wanda Landowska on Three Keyboards, by Jan Holcman. COVER: EDGAR VARESE, Pioneer in the art of electronic music. (See Recordings). Photograph by Eugene Cook. Anticipate or Be Damned: An Editorial. IRENE PAPAS By Nanda Root -- "Why am I an actress?. 1 2 3 4 5 6 7 8 9 10 11 12 13 14 15 16 17. ISSUE DATE IN THIS ISSUE ThreeBoos and You're Out By Charles Mitchelmore -- Freedom of speech was the issue. Chatwin, edited by Elizabeth Chatwin and Nicholas Shakespeare. See photo #4. 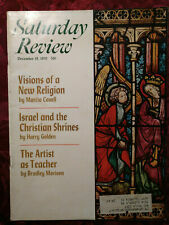 TheNew York Review of Books for5 March 1981. See photos #5-6. All in very good condition. TheNew York Review of Books for13 August 1987. One Man's Nucleomitaphobia by Bill Wickersham. COVER: The Nightmare that won't go away. The Tripwire Scenario. One man's Nucleomitaphobia. Cover painting by Stanislaw Fernandes. The Magical Madness of Flann O'Brien by Anthony Burgess. COVER: PHILIP ROTH, Author of "Portnoy's Complaint" (See Literary Horizons). Photo by Antony di Gesu. February 22, 1969; Vol LII, No 8. Not from the Singer, But for the Singer, by George Louis Mayer. A Bicentennial Prayer. . Mary Sennholz. . Praise and appeal for guidance to the Author of Liberty. How Many Servants Can You Afford?. The FREEMAN. OCTOBER 1976; VOL. 26, NO. 10. 18 19 20 21 22 23 24 25 26 27 28 29 30 31. Neighborly Ideals. January 1966. Winter Poems. Outside edge rolled; staples rusting; front cover separated from bottom staple; small chip at bottom right rear cover;otherwise solid and clean. COVER: This issue of Harper's contains the final two and climactic chapters of Alexander Solzhenitsyn's new novel, "August 1914". Neither of the chapters has been published before in English. AUGUST 1914. ALEXANDER SOLZHENITSYN. Arma Virumque Cano. A Story. JESSAMYN WEST, Illustrations by Marvin Bileck. What Are Wars For?. ISSUE DATE: JANUARY, 1949; Vol. 198, No. 1184. After Hours. MR. HARPER. The Middle East Over the Wingtip. WOLFGANG LANGEWIESCHE. Featuring Allen Ginsberg, Henry Miller and Jack Kerouac. Evergreen Review Vol. 10 No. 40, April 1966. It provides insight into how a particular program developed, the grant-making and people involved, and how the related work was carried out. It’ll make it much easier for both of us. We’ve been executing appraisals, working with liquidators and buying estates for well over two decades; we’re confident we know what we’re doing and we price fairly, based on availability, collectible-value and demand. Cover Drawing by Hal Mcintosh. August 25, 1951; Vol. XXXIV, No. 34. 1 2 3 4 5 6 7 8 9 10 11 12 13 14 15 16 17. THE DARK AND THE DAMP, Reviewed by William E. Wilson. RECORDINGS IN REVIEW, By Irvine Kolodin. COVER: ARTHUR MIZENER, Author of "The Far Side of Paradise"; Cover Drawing by Hal Mcintosh. THE FAR SIDE OF PARADISE, By Arthur Mizener Reviewed by Maxwell Ceismar. THE AUTHOR: ARTHUR MIZENER. A Sinclair Lewis Album. Miami--NewYork, 1944. A Story. . MARTHA GELLHORN. The Atlantic. Issue Date: MAY, 1947; Vol. 179, No. 5. The Snow Girl. An Atlantic "First". . WILLIAM R. SHELTON. THE NEW ATLANTIC SERIAL: End of a Berlin Diary. . WILLIAM L. SHIRER. Featuring Caroline Kennedy turns sixteen. Jean Rhys Tigers are Better Looking. October 1962 issue of The London Magazine, inVery Good condition. All pages intact, clean and unmarked, apart from handwritten "Rob Lowell" and an underlining on the front cover. We make sure to add multiple photographs so you have a complete idea of the condition. Good condition. Poetry : Captain Nitrate by Ray DiPalma. Spring 1973, 199 pages. Drawing by Stefan Waggoner. Chicago Review #88 Vol 25 No. 3.